The Talan BIZstrength Profile™ is an invaluable tool that represents where your company is at today and what it can look like in the future based on the stated goals of the company leadership. 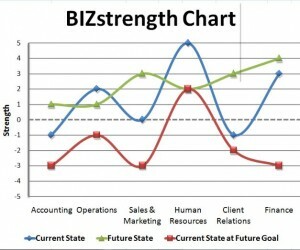 The BIZstrength Profile is created by conducting an assessment of your organization in the areas of Accounting, Operations, Sales & Marketing, Human Resources, Client Relations, and Finance. At the heart of your assessment is the BIZstrength Chart which provides a visual representation of the results of your assessment. To make decisions about how best to drive a company into the future, it is essential to know the strengths and areas for improvement that exist within the organization and understanding these strengths and weaknesses is the focus of our assessment. Once we understand where the company is at today and what the leadership wants the company to look like in the future, we can then work with you to develop a successful plan to move the company towards the stated goal. 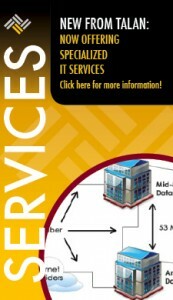 Talan has key focus in all areas of small business management and development, and together we will assess where you are at, develop a plan to get your business where you want it to be, and help you execute that plan effectively and efficiently to bring the greatest benefit to your small business. We are not about selling products, we are about building relationships and together we will change how the world thinks about small business. To discover your BIZstrength contact us today for your FREE profile.